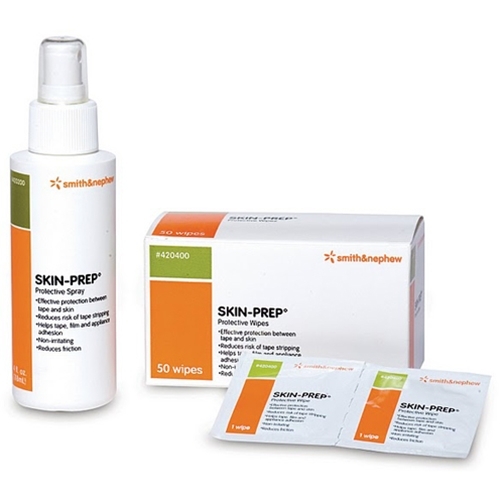 Smith and Nephew Skin Prep from HealthyKin.com forms a barrier between the patient's skin and adhesives to help preserve skin integrity and prevent insult or injury during removal of tapes and films. Works GREAT to keep my urostomy bag on skin for 7 days! Great product to help with removing tape for sensative skin. Put on before the tape is applied. It does help with keeping the skin less irritated. Great product and even better price and service. Skin preps help keep external cath's on longer. works as advertised. Helps my insulin cannula stay in place. You are the best. zoom delivery. Great product I use it to keep my brothers external catheter in place. it really works!! I have used the product for some time and it protects the skin where tape is applied to the bandages holding my dialysis cath in place. Found the site a time and money saver. Was able to order several boxes at one time. excellant product for toughening up thin skin.